Pepper is often described as the "king of spices," and it shares a place on most dinner tables with salt. The word pepper originated from the Sanskrit word pippali, meaning berry. Pepper is now grown in Indonesia, Malaysia, Sri Lanka, Vietnam, and Kampuchea as well as the West coast of India, known as Malabar, where it originated. The United States is the largest importer of pepper. India is still the largest exporter of the spice, and Brazil may be among the newest exporter of pepper. Both black and white pepper come from the shrub classified as Piper nigrum. Piper nigrum is one of about 1,000 species in the Piper genus that is part of the larger family of peppers called Piperaceae. The various species of Piper are grown mostly as woody shrubs, small trees, and vines in the tropical and subtropical regions of the world. 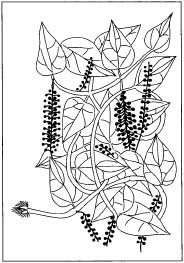 The Piper nigrum is a climbing shrub that grows to about 30 ft (9 m) tall through a system of aerial roots, but is usually pruned to 12 ft (3.66 m) in cultivation. Its flowers are slender, dense spikes with about 50 blossoms each. The berry-like fruits it produces become peppercorns; each one is about 0.2 in (5 mm) in diameter and contains a single seed. It is indigenous to southern India and Sri Lanka, and has been cultivated in other countries with uniformly warm temperatures and with moist soil conditions. Because the plant also likes shade, it is sometimes grown interspersed within coffee and tea plantations. Each plant may produce berries for 40 years. The hot taste sensation in pepper comes from a resin called chavicine in the peppercorns. Peppercorns also are the source of other heat-generating substances, including an alkaloid called piperine, which is used to add the pungent effect to brandy, and an oil that is distilled from the peppercorns for use in meat sauces. As a natural medicinal agent, black pepper in tea form has been credited for relieving arthritis, nausea, fever, migraine headaches, poor digestion, strep throat, and even coma. It has also been used for non-medical applications as an insecticide. Of course, black pepper is a favorite spice of cooks because of its dark color and pungent aroma and flavor. White pepper is also commonly used and is popular among chefs for its slightly milder flavor and the light color that compliments white sauces, mayonnaise, souffles, and other light-colored dishes. White pepper is also true pepper that is processed in the field differently than its black form. A mixture of black and white peppercorns is called a mignonette. Ground pepper is also popular in mixes of spices. A French spice blend called quartre epices consists of white pepper, cloves, cinnamon, and either nutmeg or mace. Kitchen pepper is called for in some recipes for sauces and includes salt, white pepper, ginger, mace, cloves, and nutmeg. Pepper, therefore, proves itself to be a versatile and essential ingredient in combination with other spices, as well as in solitary glory in the pepper mill. Other species of peppers, such as P. Iongum, P. cubeba, and P. guineense, produce peppercorns that are used locally for medicinal purposes, or are made into oleoresins, essential oils, or used as an adulterant of black pepper. Berries of pepper trees from the genus Schinus, family Euphorbiaceae, are not true peppers, but are often combined with true peppercorns for their color, rather than their flavor. S. terebinthifolius is the source of pink peppercorns, but must be used sparingly, because they are toxic if eaten in large quantity. Bell, cayenne, and chili peppers are not members of the Piper genus. They are classified within the family Solanacene, commonly known as nightshades. Comprised of over 2,000 species, the nightshade family is indigenous to Central and South America, although many species have been cultivated worldwide. Common nightshade species include potatoes, eggplant, tomatoes, tobacco, and petunia. Pepper was an important part of the spice trade between India and Europe as early as Greek and Roman times. Pepper remained largely unknown in Western Europe until the Middle Ages. During that time, the Genoese and Venetians monopolized sea trade routes and, therefore, also monopolized sale of pepper and other spices. Knowledge of pepper truly flowered during the European period of exploration that began in the late fifteenth century. Pepper grows in hot, humid conditions near sea level, so many of the areas where pepper grows were simply unknown to Europeans until seafaring, exploring, and empire-building began. In addition, European tastes favored the "sweet pot," in which both sweet and savory ingredients were cooked in a single pot on the hearth. The spices used most often for this kind of cooking were nutmeg, cinnamon, mace, ginger, and cloves. The pepper that was known in Europe from Roman times was the Piper longum (or long pepper) that is more aromatic and not so hot. Our familiar black pepper, or Piper nigrum, rose in popularity when the stove was introduced for cooking and sweet and savory foods could be prepared separately. Europeans valued pepper highly in the Middle Ages and the Renaissance, and pepper was often presented for gifts, rent, dowries, bribes, and to pay taxes. Portuguese explorer Vasco da Gama reached India in 1497 and opened the trade route for pepper, among many other spices. Meanwhile, on the other side of the world, Christopher Columbus discovered the New World, and in the process, he made life complicated for pepper lovers. Columbus found a large and aromatic berry he dubbed "the Jamaican Pepper." This berry is extensively used as a ground spice today, but it is called allspice. His second peppery discovery was the capsicum. Its large, mild-flavored versions come in red, yellow, and green varieties; and it also includes these three colors in fiery hot chili peppers. The capsicum peppers are not related to the pepper found in shakers and mills. Cayenne pepper is ground from dried capsicums, so it also is not a variety of the dried berry. To add further to the confusion Columbus unwittingly unleashed, the Spanish word for pepper is pimento; so the small slivers of red pimento found in olives are red pepper pieces, and allspice is also known as Jamaican pimento. Allspice, as this version of its name states, has a fragrance that suggests a mixture of cinnamon, nutmeg, cloves, and pepper. A few whole allspice berries added to the dinner-table pepper mill will spice up ground pepper. Peppercorns are the only raw material for both black and white pepper in any form. If the manufacturer produces green peppercorns, brine consisting of pure water, salt, and preservatives is used. Green peppercorns are also packed in vinegar; the vinegar or brine should be washed off the berries before the peppercorns are used in cooking. 1 The pepper berries grow on bushes that are cultivated to heights of about 13 ft (4 m). If the berries were allowed to ripen fully, they would turn red; instead, they are harvested when they are green. Harvesting is done without any mechanical equipment. Women pick the unripened berries and transport them in large wicker baskets to drying platforms. The berries are spread on these large platforms to dry in the sun over a period of about a week and a half. In their dried state, the green berries blacken to become the peppercorns we use in pepper mills. 2 Alternatively, the pepper berries can be picked just as they begin to turn red. They are plunged into boiling water for approximately 10 minutes, and they turn black or dark brown in an hour. The peppercorns are spread in the sun to dry for three to four days before they are taken to the factory to be ground. This process is quicker than airdrying alone but requires the added step of the boiling water bath. 3 If white pepper is to be produced, the peppercorns are either stored in heaps after they have been boiled or they are harvested and packed in large sacks that are then lowered into running streams for seven to 15 days (depending on location). Bacterial action causes the outer husk of each peppercorn, called the pericarp, to break away from the remainder of the peppercorn. The berries are removed from the stream and placed in barrels partially immersed in water; workers trample the berries, much like stomping grapes, to agitate the peppercorns and remove any remaining husks. Some processors now use mechanical methods to grind off the outer coating to produce so-called decorticated pepper, but many exporters prefer the old-fashioned method. 4 Black and white pepper are processed in the factory by cleaning, grinding, and packaging. Blowers and gravity separators are used to remove dust, dirt clods, bits of twigs and stalk, and other impurities from the peppercorns after they are imported from the field. Sometimes, treatments are used to eliminate bacteria on the cleaned, dry peppercorns. 5 Grinding consists of using a series of rollers in a process called cold roll milling to crush the peppercorns. Cracked peppercorns are only crushed lightly to bruise the peppercorns and release their flavor. Black pepper plant Piper nigrum. Further grinding steps crush peppercorns into coarse and fine grinds of pepper that are packaged separately. 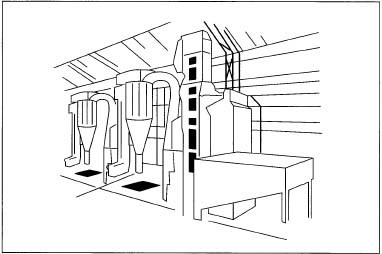 A sifter sorts the grains by size, and they are conveyed to packaging stations. Packaging varies widely among processors and includes bags, boxes, and canisters for large-volume commercial sales and smaller jars, cans, and mills for home use. Packing may also include the blending of pepper with other spices in a variety of spice mixes for preparing sauces, cajun recipes, Italian foods, seafood, and a range of other specialized blends. Because pepper is harvested by hand, quality control begins in the field with the careful observations of the harvesters. Bulk importation of peppercorns is monitored, as with all agricultural products, by government inspectors. In the factory, machinery used to process pepper is simple, and the processing is observed throughout. Cold roll milling machines crush the peppercorns by rolling them between a series of rollers. Cracked lightly, the peppercorns are able to release their flavor. cooking, in types of cooking like cajun-style recipes that are spice-dependent, in restaurant dining, and in healthful food preparation have all sparked renewed enthusiasm for the flavor and goodness of pepper. Pepper will surely have an honored place at the table as long as there are cooks, kitchens, and taste-conscious consumers. Heinerman, John. The Complete Book of Spices: Their Medical, Nutritional and Cooking Uses. New Canaan, Connecticut: Keats Publishing Inc., 1983. Norman, Jill. The Complete Book of Spices: A Practical Guide to Spices and Aromatic Seeds. New York: Viking Studio Books, 1990. Stobart, Tom. The International Wine and Food Society's Guide to Herbs, Spices and Flavorings. New York: McGraw-Hill Book Co., 1970. Walker, Jane. Creative Cooking with Spices: Where They Come From & How to Use Them. London: Quintet Publishing Ltd., 1985. Ee, Khoo Joo. "The life of spice; cloves, nutmeg, pepper, cinnamon." UNESCO Courier (June 1984): 20. Wemick, Robert. "Men launched 1,000 ships in search of the dark condiment." Smithsonian (February 1984): 128. Hela Spice Co. "The History of Spices." http://arcos.org/hela (March 24, 1999). India Spice Board. http://www.indianspices.com (March 24, 1999). McCormick & Company, Inc. March 24, 1999. http://www.mccormick.com (March 24, 1999). can anyone say the chemical method to seperate the outer coating of pepper?